bContext changes the way ideas are shared by enlivening static documents with audio, writing, and drawing capabilities. The app makes it easy for anyone (i.e. designers, architects, consultants, teachers, bloggers, journalists etc.) to add visual and verbal elements to transform complex ideas into engaging communications. 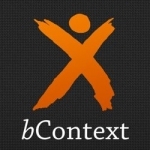 Sign up or log in to add bcontext as a friend.